Today is our first Jan Hus Day in Prague. I thought I’d repost the short bio of him I did for Reformation Day 2007 (and which, as all Wiser Time trivia buffs will recall, won me a very handsome Charles Spurgeon caricature). 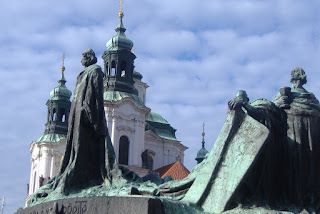 Jan Hus was born about 1370 in the village of Hussenitz, in what is now the Czech Republic. In the 1380’s he began studies at Charles University in Prague, where he earned several degrees. He was ordained a priest in 1400, and in 1402 he became rector of the University, which meant he began to preach regularly at Bethlehem Chapel, where the people of the city came to worship. Hus became an immensely popular figure as he preached regularly at Bethlehem. He preached twice a day on Sundays and feast days, wrote hymns, and introduced congregational singing in Bohemian, the language of the people, where before the only music in worship had been priests singing in Latin. He was known for his solid Bible exposition with lots of practical application. As is often the case in early periods of reformation, God’s people were being fed God’s Word, and it stirred up a desire for reform in the church. A generation before Hus, John Wycliffe, the “morning star of the Reformation,” had turned England upside down by teaching against the primacy of the Pope, proclaiming the doctrine of justification by faith alone, and translating the Bible into English, making it accessible to the common people. Wycliffe’s ideas had been condemned by the Pope, but when they began to be debated at the University in Prague Hus refused to reject them outright. In fact, the more Hus studied Wycliffe he found himself in substantial agreement with most of his writings, which he also worked to translate into Bohemian. Hus was charged with heresy for teaching the doctrines of Wycliffe, and his archbishop began to burn Wycliffe’s books whenever he could find them. Hus remarked in a sermon, “Fire does not consume truth. It is always a mark of a little mind to vent anger on inanimate and uninjurious objects.” He was summoned to Rome to stand trial, but refused to go, knowing that there would be no fair trial, only a death sentence. For this he was excommunicated, and the city of Prague was put under papal interdict, meaning there could be no sacraments, no public worship, not even Christian burial for anyone but priests. My lord, understand me well. I said I am ready with all my heart to obey the apostolical mandates. But I call apostolical mandates the doctrines of the apostles of Christ; and so far as the papal mandates agree with these, so far will I obey them most willingly. But if I see anything in them at variance with these, I shall not obey, even though the stake were staring me in the face. What shall I recant, not being conscious of any errors? I call God to witness that I have neither taught nor preached what has falsely been laid to my charge, but that the end of all my preaching and writings was to induce my fellow men to forsake sin. In the truth which I have proclaimed, according to the Gospel of Jesus Christ and the expositions of holy teachers, I will this day joyfully die. Hus’ last words were addressed to his executioner: “You are now going to burn a goose, but in a century you will have a swan whom you can neither roast nor boil.” Hus was burned on July 6, 1415. 102 years later, on October 31, 1517, a young monk named Martin Luther nailed his 95 Theses to the church door in Wittenburg. One of Luther’s early influences was the writings of John Hus, a heretic whose work he was surprised to agree with. I missed this because I was on vacation, but Jan 8 was the 54th anniversary of the deaths of the Auca martyrs: Jim Elliot, Pete Fleming, Roger Youderian, Nate Saint and Ed McCully. Justin Taylor has some interesting links. Maybe in glory we will know how many missionaries went to the field– and how many heard of Christ– because of the example of Elliot and his friends. I’m one and I know there are many others. Thy name, O Jesus, be forever blest! You should very much head over to the family blog and read my wife’s post about one of hear fears in moving to Prague. Read this Thanksgiving greeting from our Prague team leaders. We can’t wait to be there sojourning with them next Thanksgiving. Not many people get a glimpse into what life is like as a missionary raising support. Melissa and I were talking about some of our funnier moments, so I thought I’d share some with you, gentle reader. That will certainly get worked into 1) our standard support talk and 2) my Facebook status. I’ve since been much more deliberate and purpose-driven in support meetings. We always get asked about ministry to internationals vs. ministry to Czechs– e.g. why is it an English-speaking church, will you try to meet Czechs, etc. In the most formal version of our talk, this comes under a section that Melissa handles. But for the first couple of months, she had a really tough time getting a handle on the summary answer, which is that there’s a “two-pronged approach.” Really, any answer that uses the phrase “two-pronged approach” would do. But early on, Melissa tended to stumble over that point and be less than clear. In one presentation at a church, she basically gave the impression that we could care less about the souls of Czechs and probably wouldn’t walk across the street to share the Gospel with them. She was temporarily relieved of her duties where that question was concerned. More to come, I’m sure. Thank goodness it’s God moving through his people, not our mad social skills, that brings in the provision we need! When I came back from Prague I meant to write about the drastic effect of the falling dollar on missionaries serving overseas. To give some perspective, the first time we went to Prague (November 2006) the exchange rate was 24 Czech crowns to the dollar. Now it’s about 15, which means the dollar is about 30% weaker than it was 18 months ago, which means everything costs about 30% more if you’re being paid in dollars. Anyway, I now no longer need to write this because Sunday the Charlotte Observer beat me to it, profiling none other than my future boss Phil Davis, pastor of Faith Community Church in Prague. Read the article, and be sure to look at the pictures— the Davises are a good-looking bunch. Pray (regularly!) for the dollar to regain its strength. This is affecting lots of missionaries all over the world, and they’d rather be focusing on ministry than trying to build their support back up. If you have missionaries you regularly support, consider trying to raise your monthly pledge to help with their added costs. Where could you trim from your budget to help them out? Think of it as a move of wartime efficiency to get the troops in the field what they need. If you’re not regularly supporting any missionaries, this would be a great time to start, as nearly all of them are feeling the crunch. Our God is sovereign over all things, including currency exchange rates. Let’s pray that he will work quickly on behalf of his workers in the fields. Nothing fancy, but you’ll get the feel.